If you’re like me, I play music on my iPhone–a lot. Seriously, I connect it to my car’s stereo, to earbuds at work, or to a Bluetooth speaker when I’m outside messing with my plants or partaking in the never-ending task of weeding the flower beds. The problem with most music playing options is that they are a terrible drain on your phone battery. Plus the battery in the speaker also drains during music play. I might enjoy two hours-ish of continuous music playing with a standard Bluetooth speaker when I’m outside. 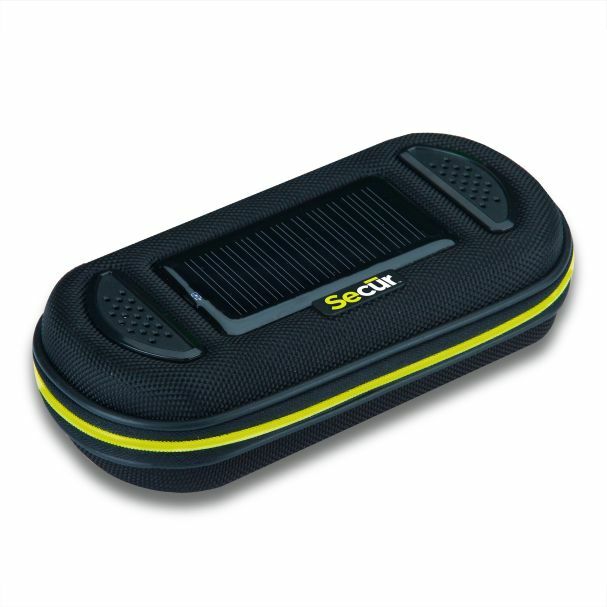 The folks at Secur Products have solved this problem with a solar-powered, water-resistant media player, the SP-5000 Solar Media Player (SP-5000). Not only can you get continuous music for as long as the unit is in the sun, your phone is safe inside the water-resistant case. Now I don’t have to leave my phone and Bluetooth speaker on the back porch far away from where I am in my fairly large back yard. I have to turn the speaker up so loud on standard Bluetooth speakers that it disturbs the neighbors who apparently have nothing better to do than to complain about my loud music. After all, I play good stuff and they should just enjoy it–it’s free. I digress, but you get the point. The SP-5000 can sit closer to me and I don’t have to worry about a little dirt or even a little water that might accidentally drip onto it. I can also arrange the case so that the speakers point toward me for better (and lower) volumes, so that I don’t disturb my neighbor’s beauty sleep, groundbreaking scientific experiments, or focus on their great American novel efforts. The SP-5000 charges itself while in the sun while you’re playing music instead of draining its battery too. If your phone battery begins to fade, you can plug it into the power adapter and charge/power your phone while you play music–all for free thanks to the sun’s abundant energy resources. Why it’s Frugal: The SP-5000 Solar Media Player is frugal because it not only protects your phone from the “elements,” but being in the sun is good for it. 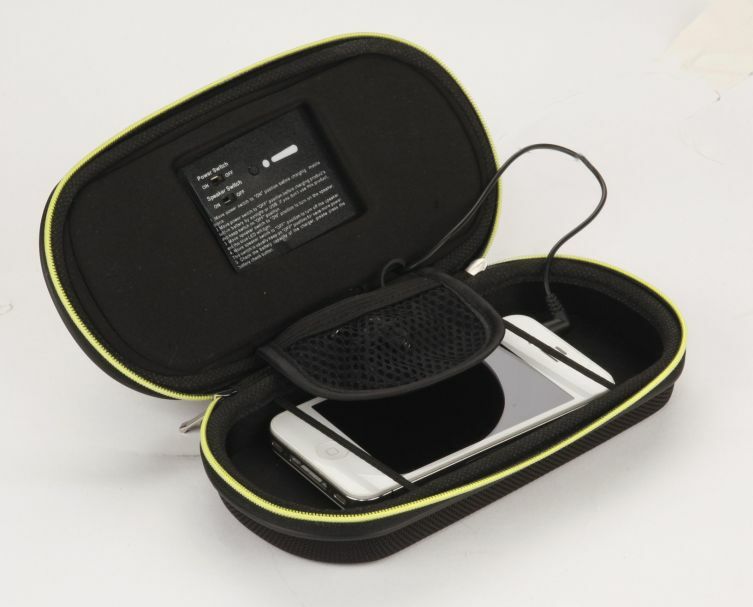 It charges your phone, protects your phone, and is a mobile music center all in one neat little, well-made package. At $50, it’s a steal–I mean, a frugal choice. This product isn’t Bluetooth, so don’t be confused by my mention of Bluetooth speakers. You have to plug the attached 3.5mm jack into your phone, power on the unit, and then power on the speakers. One reason that I say that the SP-5000 is frugal, although I often complain about product pricing, is that this unit is only $50. Most, if not all, Bluetooth speakers, that offer no charging feature and no protection for your phone. So, really you’re getting a very tough case, multiple cables, a solar charger, and two, 3Watt speakers for very little cash. If that’s not frugal, then please spend more money for a lesser product. The Secur Solar Media Player SP-5000 is a well-made, quality product that is three products in one: media player (speakers), a protective case, and a charger. I’m not sure what else you can ask for in its price range. Recommendation: It’s a great product at an excellent price and if you ever listen to music outside, you need this. Strong buy. Secur Products is dedicated to constant product development and technological innovation to produce leading edge products for emergency preparedness, outdoor sports, portable power solutions and alternative energy. Secur Products is a division of Maverick Industries, Inc. based in Edison, New Jersey. For over 30 years, Maverick has been a leading manufacturer and distributor of household electronics and electric appliances.